I have no idea what’s got me in the mood for lentil soup. Perhaps the cold front that’s come through this weekend and put temps back in the 50s. I’m sure this is the last hurrah of comfortable weather before “spring” (AKA 80+ temps) arrives for good in Mississippi. C’est la vie. I’m a weirdo for my state. I love cold weather. Anyway, I have never really made a lentil soup before. 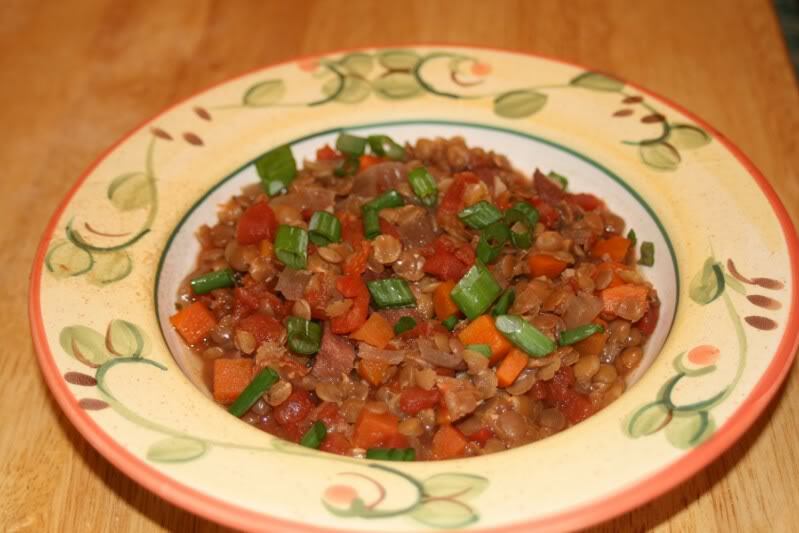 I mean, sure, I’ve added lentils to other soups in a sort of “everything but the kitchen sink” fashion, but I’ve never made a soup where lentils were the star of the show. Not sure why I picked them today, except that it’s Sunday, and I’ve got lots of work to do to catch up on grading in my classes, so I wanted something simple, easy, and filling that I didn’t have to babysit. Of course, that means crock pot. I perused a bunch of lentil soup recipes across the ‘net this morning, but nothing quite hit the right chord with me, so I wound up taking elements from all of them and making this up, largely out of stuff from my freezer, which was full to bursting and needed thinning out. Anyway, here’s my last minute entry to Kahakai Kitchen’s Souper Sunday this week. Go ahead and turn on your crock pot to get it heating up. Dice everything and add to the crock pot. If you have any ingredients frozen (my ham, onions, carrots, and stock were frozen), then warm your stock in the microwave before adding to the crock pot. If you’re going to be cooking all day on low, this is less of an issue, but this does shorten the cooking time. Add pepper, thyme, basil, and oregano. You shouldn’t need salt with the stock and the ham, but if you do, wait until it’s cooked and salt to taste. Add water (hot if you’re in a hurry) and wine. Cook on high for 4 hours or low for 11. I’m sure you could do this on the stovetop as well, but I’m not sure about the cooking time. Serve with cornbread or grilled cheeses. FYI, I snipped some scallions over the top because I liked the color, but I actually think the soup is best without them. The nutrition info works out to 424 calories per bowl (4 servings), 7.35 grams of fat. That looks so hearty, and easy! With some buttered brown bread … mmmmmm! I think I’m being ruled by my stomach today. Everything everybody’s mentioned sounds SO GOOD. I love a good lentil soup and this one is so bright and colorful–so pretty. Thanks for sending it by Souper Sunday, I just got the post up. Have a great week! This looks great, thanks for the recipe! Aren’t the lentils going to be tough b/t the salt in the broth and the acid in the tomatoes? (I’ve had this problem several times.) What I’m doing these days is soaking the lentils over night before putting into crockpot the next day.